Toon Diepstraten was born and raised in the Netherlands He started drawing and painting at a very young age, he attended Art-academy in `s-Hertogenbosch. During this time he got highly involved in aplying computers in Art. Using his own artificial intelligence routines this resulted in his graduating with a software-program (First in Holland) that could communicate in dutch with visitors and changed the environment accordingly by displaying paintings, drawings and even Poetry. For years Toon went ever deeper into virtuality. Upto 2002. After reaching 40 he returned to `reality' and started making physical objects again in an attempt to reconnect. Feeling the brushes, smelling the paint, hearing the canvas. The autonomous works of Toon Diepstraten can be regarded as highly subjective views on human emotions and fantasy. 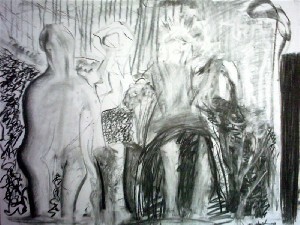 His daily charcoal drawings are loaded with a disarming mysticism. Discipline has changed creating them into an emotional language. His paintings have the same intensive "stories".